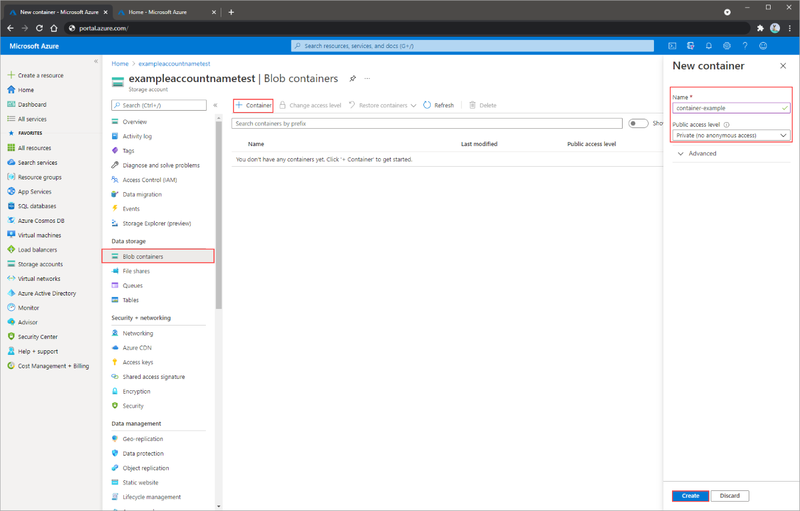 In this quickstart, you learn how to use the Azure portal to create a container in Azure Storage, and to upload and download block blobs in that container. Navigate to your new storage account in the Azure portal. In the left menu for the storage account, scroll to the Blob service section, then select Blobs. Select the + Container button. Type a name for your new container. The container name must be lowercase, must start with a letter or number, and can include only letters, numbers, and the dash (-) character. For more information about container and blob names, see Naming and referencing containers, blobs, and metadata. Set the level of public access to the container. The default level is Private (no anonymous access). Select OK to create the container. Block blobs consist of blocks of data assembled to make a blob. Most scenarios using Blob storage employ block blobs. Block blobs are ideal for storing text and binary data in the cloud, like files, images, and videos. This quickstart shows how to work with block blobs. In the Azure portal, navigate to the container you created in the previous section. Select the container to show a list of blobs it contains. Since this container is new, it won't yet contain any blobs. Select the Upload button to upload a blob to the container. Browse your local file system to find a file to upload as a block blob, and select Upload. Select the Authentication type. The default is SAS. Upload as many blobs as you like in this way. You'll see that the new blobs are now listed within the container. Navigate to the list of blobs that you uploaded in the previous section. Right-click the blob you want to download, and select Download. To remove the resources you created in this quickstart, you can delete the container. All blobs in the container will also be deleted. In the Azure portal, navigate to the list of containers in your storage account. Select the container to delete. Select the More button (...), and select Delete. Confirm that you want to delete the container. In this quickstart, you learned how to transfer files between a local disk and Azure Blob storage with Azure portal. To learn more about working with Blob storage, continue to the Blob storage How-to.